[share_ebook] TOEIC Test Official Guide â€“ ETS - sÃ¡ch luyá»‡n toeic cá»§a ETS | Free eBooks Download - EBOOKEE! Posted on 2011-11-25, by wins. Although this book does not provide you with a large number of helpful strategies or tips for understanding the TOEIC test (unless becoming more familiar with late-1970s tacky fashion styles is part of the TOEICâ€“check out the photos), it is the most important book to have for your TOEIC test preparation journey. This guide, prepared by ETS, is the only one that can give you practice with â€œrealâ€ TOEIC material. Test-preparation guides prepared by other companies try to approximate ETSâ€™ style, but they can never match the exact difficulty level of an actual ETS test. In addition, for (amount), TOEIC Official Test-Preparation Guide includes an ample number of practice exercises: There are two mini-tests, two complete tests, and practice questions for each of the seven sections. The authors include explanations for all of the answers too, which is always helpful. Working through all of this material should give you a decent understanding of and preparation for the TOEIC test. The major drawback of TOEIC Official Test Preparation Guide, as stated above, is that it doesnâ€™t really help you understand how the TOEIC is constructed (i.e. which grammar points are tested in Parts 5 and 6, what types of questions are most frequently asked in the listening section, etc.). However, since most of the material on the TOEIC is assessing your genuine level of English fluency, â€œtricksâ€ such as this probably wonâ€™t help you in the long run. 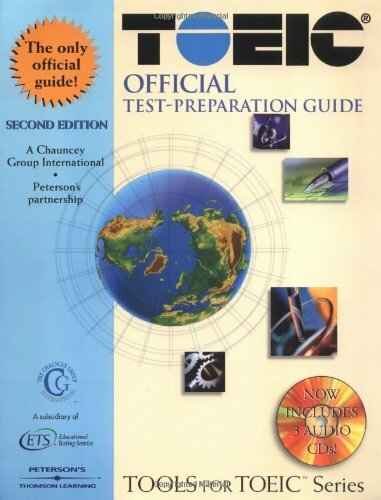 If youâ€™re only going to purchase one book to prepare yourself for the TOEIC test, it should probably be this one. No comments for "[share_ebook] TOEIC Test Official Guide â€“ ETS - sÃ¡ch luyá»‡n toeic cá»§a ETS".